With U.S. midterm elections just days away, one Republican state governor is coasting to re-election despite promising to aggressively push for higher taxes on the oil and gas industry. Gov. John Kasich of Ohio has overseen a rapid expansion of drilling in his state, with oil and gas production quickly rising. Drillers have been targeting the Marcellus Shale in Ohio, and increasingly, the deeper Utica Shale. The same geology that has made Pennsylvania a major energy producer stretches across the border into Ohio. In fact, Ohio tends to hold a greater preponderance of petroleum liquids instead of dry gas, which can provide a much better return for drillers. The Utica holds an estimated 38 trillion cubic feet of natural gas and 940 million barrels of oil, according to an assessment from the U.S. Geological Survey. Gov. 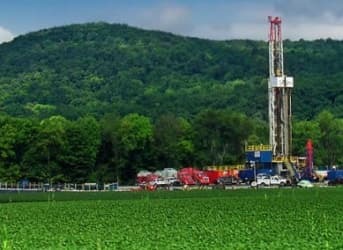 Kasich has supported the development of oil and gas in his state, and rigs have multiplied in the eastern counties of Ohio near the border with Pennsylvania under his watch. The FracTracker Alliance, a group following the oil and gas industry, has produced an excellent and detailed map of the drilling footprint in eastern Ohio, which can be found here. Kasich has tried to raise taxes on the industry before, but in the spring of 2014, the state house trimmed his proposal of a 2.75 percent severance tax on the industry down to 2.5 percent. The bill passed but is now stalled in the senate. Kasich argues that without a sizable tax on oil and gas production, all the benefits just accrue to the drilling companies, many of which are not from Ohio. “And then they take our stuff and they go back and they cut their taxes, and they have our wealth in their state and they don’t pay for it. We need to stop this,” he recently said during a speech in Columbus. Kasich will almost certainly win a second term on Nov. 4 by a comfortable margin. In an average of polls from RealClearPolitics at the end of October, he was leading by 22.7 points. That has emboldened his call for higher industry taxes. He says he wants at least a 2.75 percent tax, and has at times called for 4 percent. Democrats earlier this year wanted a 5 percent tax. But with all the campaign contributions from the oil and gas industry going to Republican legislators, Kasich has failed to get his way thus far. Republicans in the GOP-controlled state legislature say increasing taxes on the oil and gas industry will deter investment and force many producers to leave the state. As it stands, Ohio’s severance tax amounts to less than 1 percent. By way of comparison, Texas – the home of the Eagle Ford and the Permian, which together account for about one-third of the entire country’s oil production – has a severance tax of 7 percent. Even if the Republican bill that calls for a 2.5 percent severance tax were to pass – a rate that Gov. Kasich has called “puny” – Ohio would still have the lowest effective tax rate on the oil industry out the top producing states in the country, according to an Ernst & Young analysis. “[W]e can’t let these companies take our valuable stuff out of this state and not pay for it. It’s – I feel very passionately about this,” Kasich said recently in an interview with Ohio Public Radio. His plan is to use the tax revenue to reduce taxes on all Ohioans, a proposal that is popular across the state and one of the biggest reasons he’s expected to remain in the governor’s mansion.